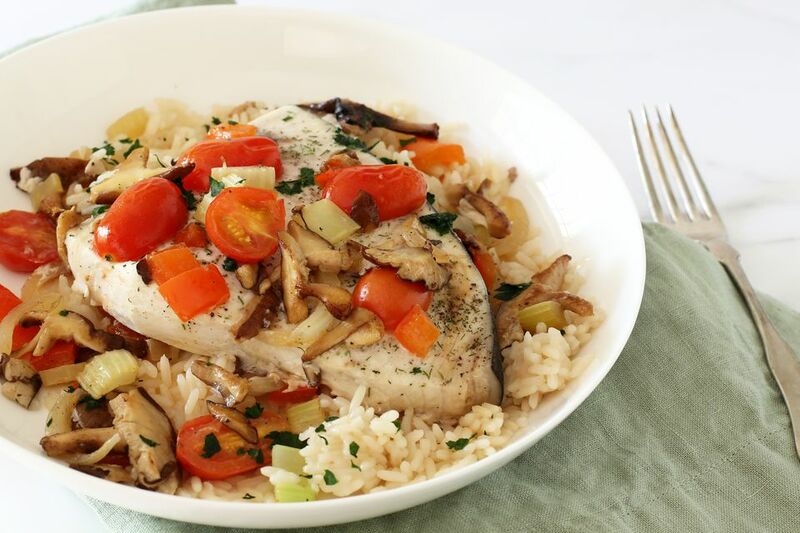 These swordfish steaks bake to perfection with a colorful combination of tomatoes, mushrooms, celery, onions, and bell peppers. It's a Creole-style dish with a dash of Louisiana spice for flavor. While swordfish is a delicious and nutritious seafood choice, it does have a higher level of mercury than most species and should not be eaten as frequently. Because mercury can harm the nervous system of unborn and small children, the U.S. FDA and EPA advise that women who may become pregnant, pregnant women, nursing mothers, and young children avoid eating swordfish and other fish high in mercury. This recipe makes enough for four people, but can easily be scaled down to make an elegant dinner for two. Serve the swordfish steaks and vegetables on a bed of rice or serve them with roasted potatoes. Give the mushrooms a quick rinse; dry them thoroughly and then slice thinly. Peel the onion, cut it in half and slice thinly. Slice the bell pepper in half lengthwise; remove the seeds and white ribs and dice half of it. Wrap and refrigerate the remaining half for another use. Heat the olive oil in a skillet over medium heat. Add the sliced mushrooms and onion along with the diced celery and bell pepper. Cook, stirring, for 8 to 10 minutes, or until the vegetables are tender. To the sautéed vegetables, add the lemon juice and some salt, and pepper, to taste. Stir to combine the ingredients. Spray a large shallow baking pan with nonstick cooking spray or lightly grease the pan with vegetable oil. Spread half of the sautéed mushroom and onion mixture over the bottom then arrange swordfish steaks on top. Sprinkle the swordfish steaks with the Creole seasoning. Place a piece of bay leaf on each steak. Slice the grape tomatoes in half. If using large tomatoes, slice them thickly. Scatter the tomatoes over the swordfish steaks. Sprinkle remaining mushroom and onion mixture over the fish and drizzle with the water or broth. Cover the pan tightly with foil and bake in the preheated oven for about 20 to 25 minutes, or until the fish registers 145 F on an instant-read thermometer inserted into the center of a thick steak. If it isn't possible to check for doneness with a thermometer, test the fish for flakiness with a fork. Insert the tines of a fork in a swordfish steak at an angle and then gently twist it, bringing some flakes up. The fish should flake and appear opaque. If the fish is still slightly translucent in the center, give it a few more minutes in the oven.